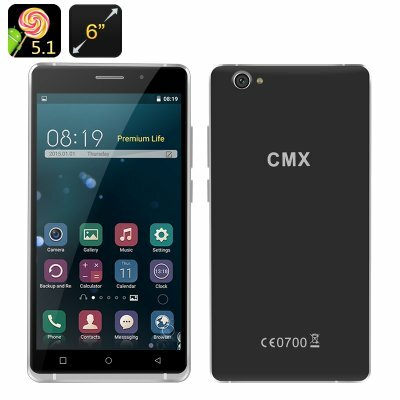 Successfully Added CMX Phablo Smartphone - 6 Inch Screen, Quad Core MTK6580, Android 5.1, Bluetooth 4.0, 2 SIM, Hot Knot (Black) to your Shopping Cart. The CMX Phablosmartphone is a modern phablet, coming with a 6 inch screen, a quad core processor, Android 5.1 and 2 SIM cards. Enjoy all your media, from movies to games and even ebooks, on a large 6 inch screen. With the support of the powerful Quad Core MTK6580, you will get to enjoy a rewarding viewing and playing experience, as well as do lots of multitasking. A nice feature of the CMX Phablo smartphone is Hot Knot. Similar to NFC, it allows for fast data transfers between Hot Knot supporting devices. All you need to do is enable the feature and touch the screen of your smartphone to that of the other device you want to exchange data with. Great for sharing photos, music and other files, Hot Knot is sure to make your mobile life much easier. With Android 5.1 things get even better. You have an even more user friendly interface, loads of customization options and a nice set of other upgrades. What’s more, no app, game or tool at the Play Store will be out of your reach. The 2500mAh battery gives you up to 4 hours of non-stop talking time + 96 hours of standby. With 2 SIM cards, you have lots of ways to separate your private and business mobile accounts, and Bluetooth 4.0 will guarantee a smooth connection to a variety of other devices. The CMX Phablo Phablet comes with a 12 months warranty. Brought to you by the leader in electronic devices as well as wholesale Android Phones..